How to prevent mold in bathroom? No matter how much you clean, your bathroom is always going to be heaven for mold to grow. You can thank high humidity for that. Since humidity takes almost all the credit for bathroom mold, the best way to prevent mold growth is to control the level of humidity. It is very important to take the necessary precautions in order to prevent mold from growing in your bathroom. In case you actually notice signs of mold during your check, it is time to call professionals to determine the type of mold and treat it while still young. As previously mentioned, bathroom mold is often caused by a high level of humidity, which happens when you take a shower. However, humidity is not the only cause of bathroom mold. Poor ventilation is another one. Most people close their bathroom door when they are showering. By doing this, they trap all the moisture-laden steam produced by a hot shower. Since there is no airflow during shower time, moisture then attaches itself to the floor, walls and plumbings, giving mold the perfect conditions to grow. The fact is that bathrooms are the wettest areas in a house, except maybe the basement. Even if you ventilate your bathroom properly, all the dampness caused by the water in showers, sinks, and even toilets, will eventually cause mold to grow. There is, of course, some extra water in bathroom mats and towels, which can easily become small mold heaven. Last but not least, deteriorating caulk is another common cause of bathroom mold. When grout begins to crack, moist air from a steamy shower can easily find its way into the sides and back of your tile. With paint as a source of food, darkness behind the tile and now moisture, you might have a new pet hiding. Where to look for bathroom mold? The main problem with bathroom mold is that it can appear almost anywhere – from caulk to towels. Bathroom is perfect for mold growth due to a constant high level of humidity. Of course, if you are not sure whether or not you have mold in your bathroom (especially behind tiles, which is tricky to spot), you can always rely on professionals to do all the necessary checks. Furthermore, they will provide insights into how to keep your bathroom mold-free. In case you already have bathroom mold, they will deal with it effectively to prevent it from coming back. Now that we have covered all the circumstances which can lead to mold growth and its favorite bathroom places, it is time to create a mold-resistant bathroom. Let’s start with the number one cause – excess moisture. Since humidity is actually the main cause of mold, the first thing to be concerned about is ventilation. If you don’t already have bathroom fans, now is the time to get and install them. Keep your fan on for up to 30 minutes after each shower. Opening the door and windows will do the same trick if, for any reason, you cannot afford this investment right away. We have already mentioned that keeping the bathroom door closed while showering can increase the chances of mold growth in your bathroom. In case you still do not want to shower with the bathroom door open, or it is too cold to open a window, you should opt for a strong and effective exhaust fan that will compensate for this. Mechanical exhaust is crucial in controlling and expelling excess humidity caused by showers. Of course, leaving the window open will not help you if you live in a humid climate. If this is the case, you will have to rely on dehumidifiers to prevent mold. They are often inexpensive and freestanding, which lowers the installation costs. It is very important to keep in mind that mold needs as little as 55% humidity to grow, so do make sure that your dehumidifier is set right or you may still have a problem. As soon as you are done showering, get rid of as much water as possible so that it doesn’t have time to evaporate and cause mold. A simple squeegee should do the trick as well as a quick wipe of the tub or sink. You can use a washcloth to get to the tile grout and corners where mold has a tendency to start growing. Thoroughly clean your shower, tub, sink and toilet once a week to ensure no excess water has piled up. You can use various commercial cleaners and supplies such as scrub brushes and washcloths to clean your bathroom and prevent mold from invading it. Thoroughly clean your bathtub, both inside and out. If you have shower curtains, take them down and wash them in the washing machine if the fabric allows it. If you notice dark spots on them, do not try to clean them up – throw them away immediately. Do not forget the towels too! After using a towel a couple of times, wash it in hot water and ensure it is completely dry before you store it back. You can swap fabric softeners for vinegar if you have sensitive skin or if you are allergic to them. The key to protecting your bathroom from mold is to keep everything dry. Almost any place in your bathroom is a potential mold-growing place – walls, windows, shower curtains and floor mats. Every time you step out of your bath or dry yourself, what you leave behind is actually a wet piece of food for mold. That said, it is very important to pay attention to pieces of cloth and additional equipment often found wet in a bathroom. Since shower curtains are in direct contact with water and often get wet without getting enough time to dry, you should change vinyl or plastic shower curtains for those you can actually wash in a washing machine. Look for cotton, hemp or nylon as you can easily wash them in hot water. Having done that, you can simply run them through the spin cycle of your machine to remove excess water. Leave it to dry, preferably outside, and you are one step closer to preventing mold from growing on your curtains. In addition, make sure your bathroom mats are washed regularly in case you have the non-slip kind. Use very absorbent floor mats that will help ensure the water splashed during showering doesn’t find its way onto your tiled floor. Don’t forget to dry the floor properly each time you clean or shower. 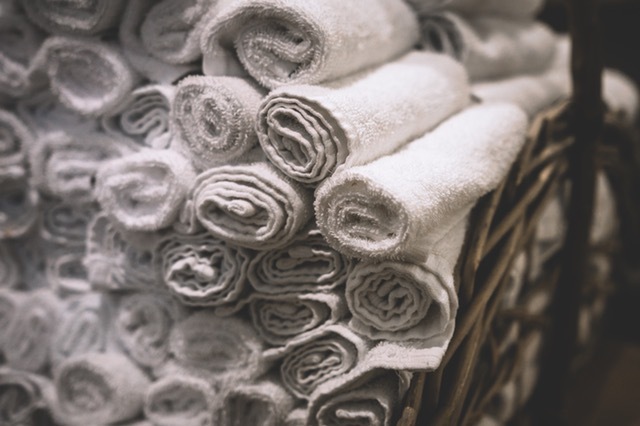 Towels are often overlooked, but they can easily cause many problems as well. If not properly dried after each use, they become a surface for mold to develop on. If you usually reuse a towel for several showers, make sure you dry it well after each use before folding it. Regularly wash towels in hot water and hang them outside to dry whenever possible. Cracked grout is the perfect surface for mold to grow on, and it’s often the place where you can spot it easily. Replacing your shower grout every 6 months is the most important step you can take to keep mold out of your bathroom. It’s best to clean your tiles and grout once a week with a pH-neutral cleaner, to prevent mold from invading and developing. Each time you change the grout, make sure to seal it with a latex penetrating sealer. The pores in the grout will absorb it, which will provide protection from mold. While it is true that some of these sealers can be expensive, a choice of high-quality sealer will keep your grout mold-free longer than the 6 months we mention above. Depending on where you wash your clothes, you might also have an additional room to take care of. If you have a separate room for laundry, the possibility of mold developing in there is practically the same as in the bathroom. With that in mind, you should check this room as regularly as all the others. In the laundry room “situation”, you should take the same precautions to prevent mold from growing. Start with the basics – make sure your windows are open regularly and fans turned on. 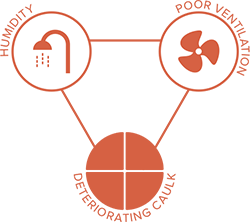 If there is a need for them, add dehumidifiers to keep the level of humidity under control. Floor covers can also be a base for mold to grow on, therefore it is very important to clean them regularly and to keep them dry. If you have carpets, ensure that there are no wet spots or actual signs of mold. Regularly check behind your washing machine to make sure everything is leak-free, and keep your washer slightly away from the wall so that there is plenty of space for air to flow and keep the wall dry. Check if your dryer exhaust pipe is well connected and properly sealed. If not, the hot, humid air from the dryer will seep out and wreak havoc. While you are at it, don’t forget to check the inside of the washing machine as well. Additionally, be prudent in cleaning any dust and excess laundry lint which may be collecting around the dryer area, and behind the machines. This is prime food for mold. In case your laundry room is in your basement, it is very important to devote time to mold-proofing your basement, which we will talk about in a separate chapter. Now that you know how to prevent mold in the bathroom and laundry room, it’s time to get things done. Go through each part of this chapter, check every part of your bathroom and do the necessary cleaning/drying. If you spot any stubborn mold, contact professionals to ensure that that is the only moldy place, and to clean it properly before it spreads.